Simultaneous operation of up to 19 keys without conflict, 5 multimedia keys, interchangeable “WASD” keys and WIN keys can be disabled for gaming. 7 Cricular and Colorful Breathing LED Light Effect：Red, Green, Blue, Yollow, Purple, Cyan, Pink (Warm tips: cannot set in one specific color); Light-off mode: forward/back button DPI. Note: This “Backlit keyboard” is associated with membrane keyboard where all keys are same membrane and backlit is like a central light shared by all. The letters are not backlit. But the bold, bright characters make the keys easier to read—even if you have less than perfect vision. With 19 anti-ghosting key: Simultaneous operation of up to 19 keys without conflict; 5 multimedia keys, interchangeable “WASD” keys and WIN keys can be disabled for gaming. Underthe keyboard, there are two rubberized holders to prevent it from slip. Drainage Holes in the back, protects your keyboard from runaway liquids. 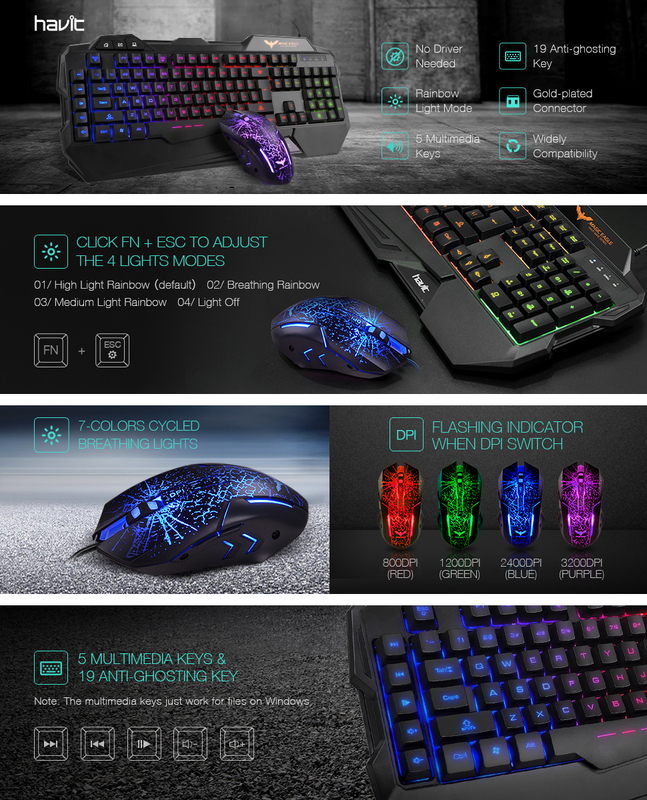 Click Fn Esc to adjust the 3 lights modes. Breathing 7 color, solid 7 colors or lights off as you like. Micro switches provide crisp, firm clicks. Plug-and-play,no additional software of firmware is required. Unique‘breathing’LED light provides a soothing and calming ambient light. Four different colors provide a constantly changing and unique look. Gold-plated connector,ensure the stable connection and low latency.